Everyone loves having a beautiful smile, yet many people struggle to maintain proper oral health procedures to keep their pearly whites shining for the long haul. The good news is that modern dentistry has evolved to the point that we are now able to hold onto our teeth for longer, resulting in older residents with bigger smiles. As your local dentist, Concord Smile is here to help Californians wear their smiles proudly. From annual dental exams to emergency services, our experts are here and ready to deliver the best service possible with all of our general dentistry services. Regardless of how well we take care of our natural teeth, some circumstances can develop where tooth extractions are unavoidable. Read more below to learn about these causes, and be sure to contact our local dentist if your family is in need of an exam! Bacterial complications can lead to the need for an emergency tooth extraction. Tooth decay occurs when the enamel and dentin in your tooth breaks down, leaving the root open to attack. If bacteria is able to get into the pulp of your tooth, an infection can develop which may require an immediate intervention. Your dentist may be able to perform a root canal, which pulls out the afflicted pulp and replaces it with a durable substance. Root canals are often seen as the last resort before tooth extraction. If this procedure and an arsenal of antibiotics do not help, you may need to pull the tooth to prevent further problems. Periodontal disease is one of the top reasons why tooth extractions occur. This common problem works to recede the gum line protecting your teeth, paving the way for infectious agents. If left untreated, the toxic nature of gum disease will work to erode the bone and connective tissue surrounding your tooth. Without support, and with a slew of immune-compromising agents, tooth extraction may be the only solution. For some individuals, the presence of too many teeth can lead to issues. Oftentimes, your dental expert will recommend a tooth extraction simply to make room for other teeth. This is often done just before braces are installed, supplying patients with enough room for proper alignment. Otherwise, your teeth may not have enough room to come in correctly! Wisdom tooth extraction is another common procedure that many young adults must go through for a comfortable smile. Most individuals require wisdom tooth removal during their teenage years, or shortly before the wisdom teeth begin growing in. Failing to plan for these additions properly will lead to misaligned smiles, jaw concerns, and more. It’s important to remove your wisdom teeth before they come in to avoid the pain of growing impacted teeth. 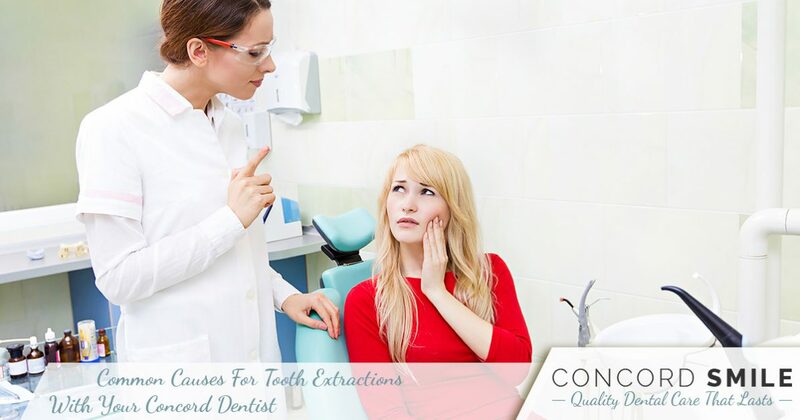 While these reasons account for a number of causes behind tooth extractions, there are numerous more causes out there. Anyone in need of professional oral health assistance can benefit from scheduling an appointment with Concord Smile. As Concord’s general dentistry experts, we strive to deliver amazing results each and every time. Our dentists and periodontists will work to develop a personalized care plan for your smile that is safe, affordable, and cost-effective. Contact us today to learn more or to schedule your dental exam!